CFP® Professional accredited financial planning done well. It’s all about clients, their lives, and how money can help them maintain and retain the life they really want. Think collaboration, co-planning and coaching rather than sales or consulting therefore more relational than transactional. Lifestyle Financial Planners invite and consult clients to the planners’ office space, similar to a doctor or an attorney’s office. 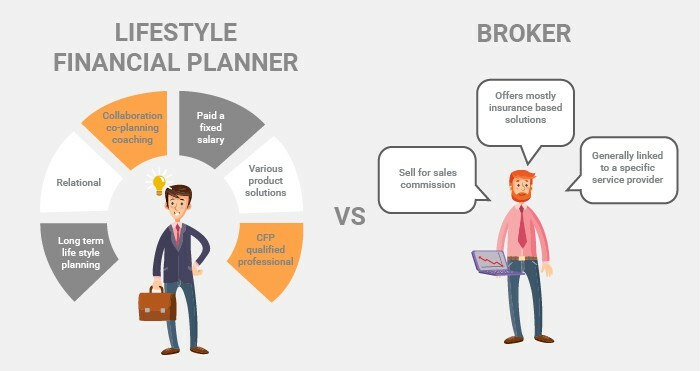 Lifestyle Financial Planners are independent and are able to do research to find the best possible solutions for each planning scenario and are not tied to a specific set of products or solutions. People willingly pay for this experience. All Ultima’s Lifestyle Financial Planners are CFP® qualified planners (or in the process of obtaining the qualification) and are remunerated based on fixed salaries. Brokers act for the industry and sell products for sales commissions. Brokers are remunerated based on the amount of products sold and not the advice given, therefore conflicts of interest are high and salespeople struggle on the transaction treadmill, without creating any lasting business value. Brokers generally travel to clients and enter the client’s space for consultations. Brokers are generally linked to a specific service provider and tied to a certain set of products or solutions.